News (29 oct 2012): Reception of beacon successful! 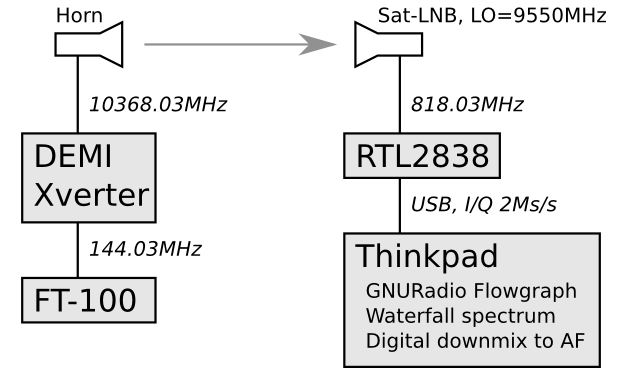 News (22 dec 2012): Reception of own transmission using Sat LNB ! The transverter is in the middle, the Yaesu FT-100D acts as 144MHz IF receiver. 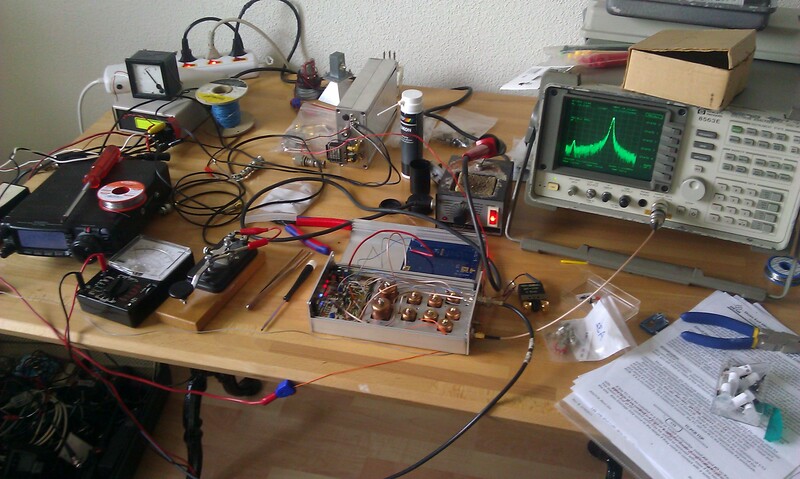 The A32 synthesizer on the left acts as a marker generator, and transmits on 1152.022 MHz. The 9th harmonic on 10368.198 can the be received using the transverter. Closeup on the .A32 and the BAS46 diode that is used to generate harmonics. 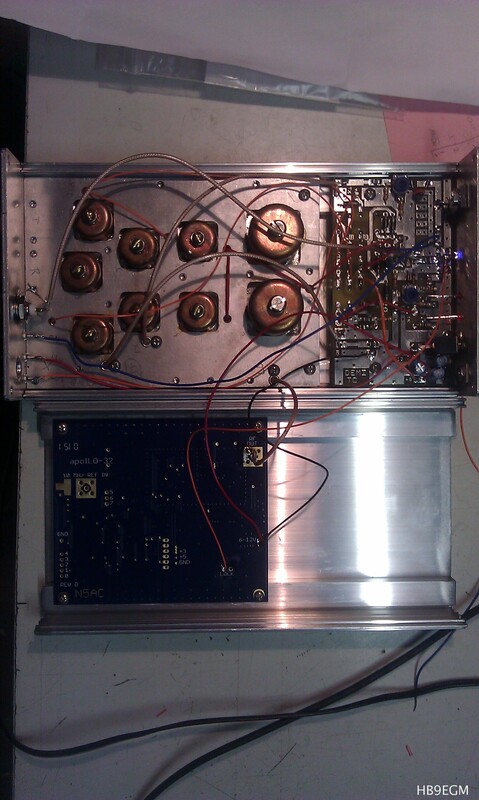 Top view on the opened transverter: The A32 in the lower half generates a LO of 1136 MHz. 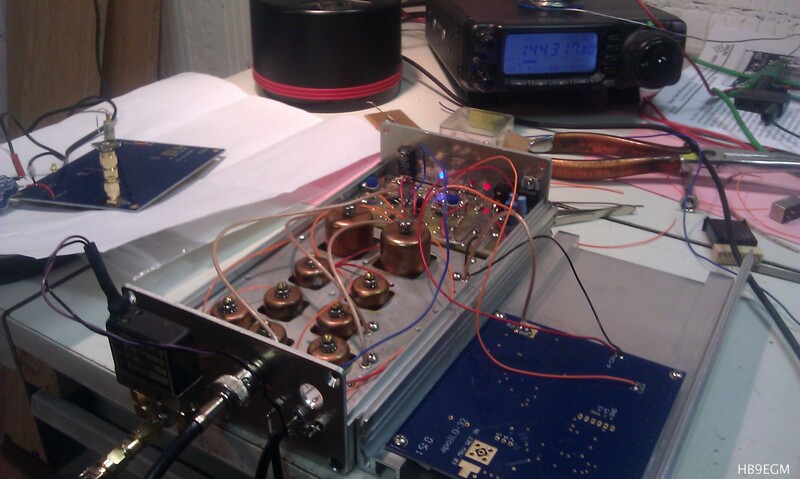 It gets multiplied on the transverter board to 10.224 GHz. The board on the top right is the control board, acting as switch for the 2m IF and as power distribution. 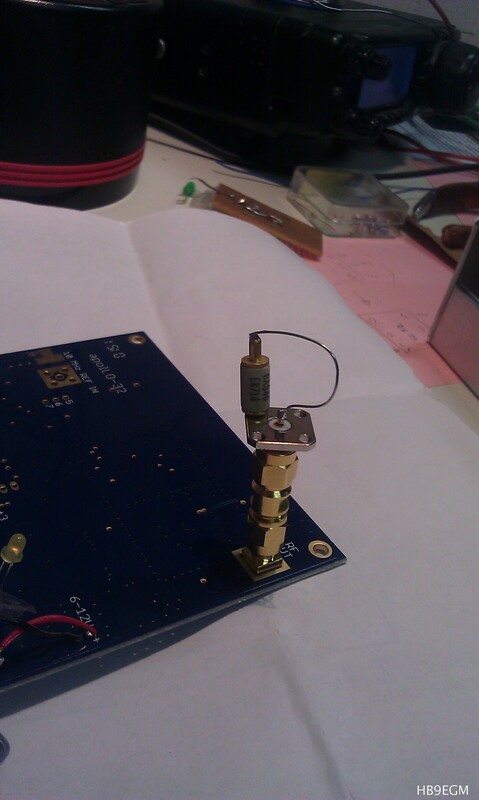 10GHz TX / RX Relay and tiny antenna used for reception tests of the A32 marker generator. From left to right: 10GHz RF TX, 10GHz RF RX, 2m IF, PTT (Pull to ground), 13.8V, AUX (Relay driver). The hole is there for an external 10MHz reference clock BNC connector. In practice, it was on 144.137, which can be explained simply by the fact that the two 10MHz TCXOs on the two A32 boards are not on the same frequency. They can be tuned, but this requires precise equipment. The temperature sensitivity is quite noticeable also. When you put your finger on the TCXO, the received tone moves a few hundred Hz in one second. 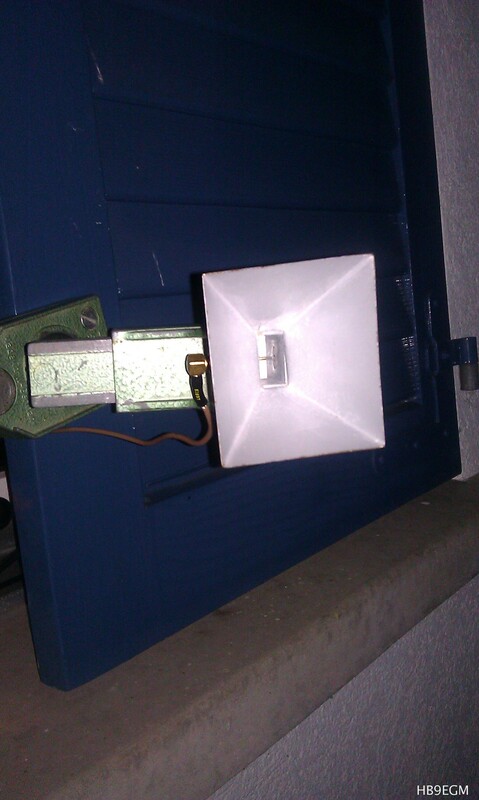 29.10.2012, 2030z: RX of HB9MPU JN47HD beacon successful! I had a modified satellite LNB I did not use, and whose LO frequency I had measured some time ago. 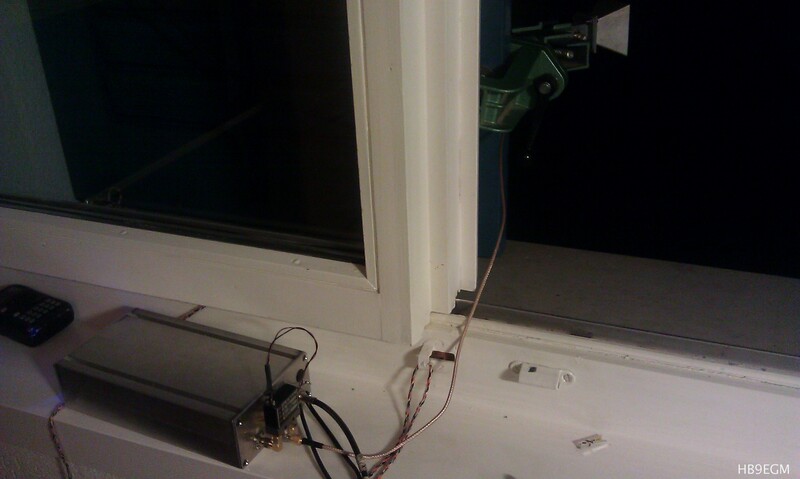 This LNB can be used to receive 10GHz signals, as described by EA4EOZ on his blog: http://ea4eoz.blogspot.ch/2012/09/lnb-and-its-ham-radio-usage.html. Tx in CW on IF=144.031MHz, RF=10368.031MHz, down-converted to 818.031MHz. It is clear that the LO in the LNB (It's a dielectric resonant oscillator) and the oscillator in the RTL2832 (a cheap quartz) are not very stable nor accurate, which can be seen in the spectrum and in the RX frequency I had to chose (819MHz instead of 818MHz). This shows that the transverter is able to output a signal on 10.368MHz. 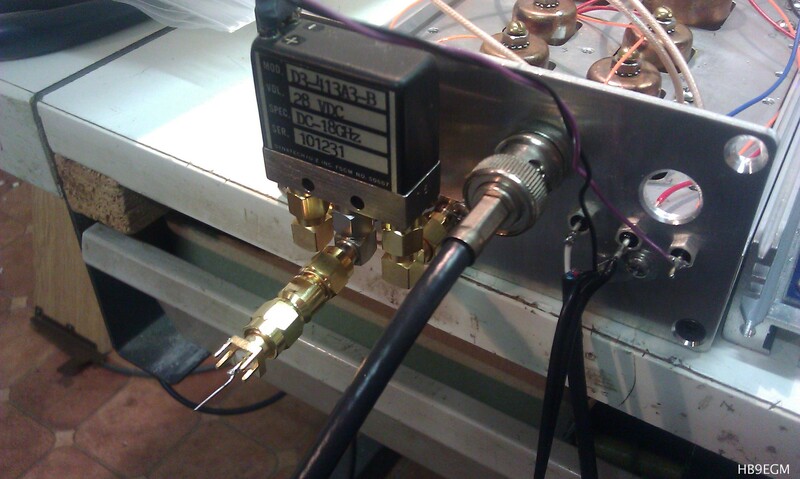 The same kind of PLL-LNB is used at the http://maxiplaya.dyndns.org:8901/ WebSDR. 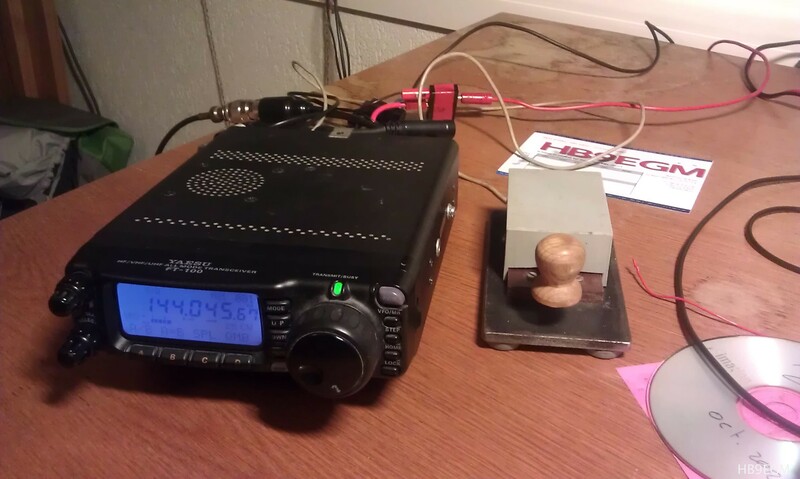 on 05.05.2013, small QSO with HB9BBD ! I also met him before, and I learned a lot from him. Many thanks! 02.11.2013: Replaced the input MMIC by a NE32484a offered by HB9BBD, adding adjustable negative voltage source for gate, and reducing drain voltage. Let's see if it brings something ! 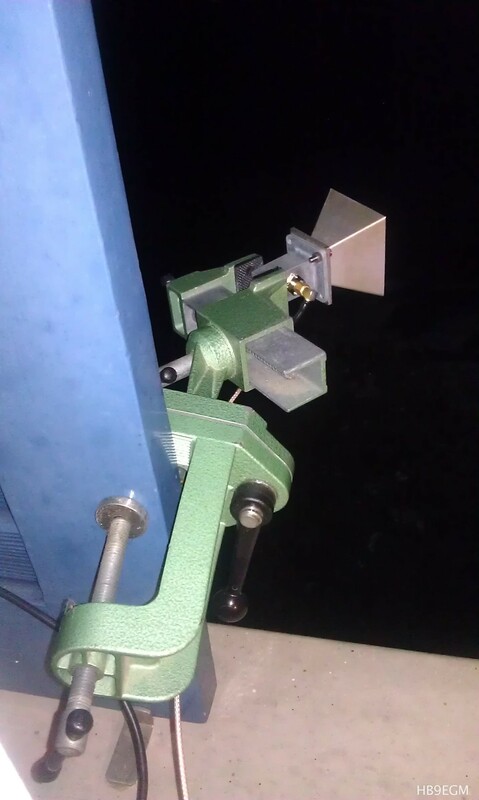 An antenna: Make a better SMA to Waveguide transition (this one uses a recycled cavity which doesn't have holes at the right place). Also, build a feed and a tripod for the small dish.